Hello! Many of you have already checked out this guide designed to help you to actually enjoy the weeks ahead (crazy idea, right?). 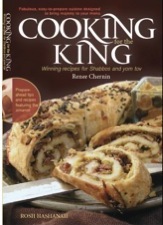 And for those that did, you were entered to win a copy of Cooking for the King, first edition for Rosh Hashanah. The first edition is packed with recipes that are naturally kosher for Passover: Amazing Cabbage Soup and the low fat, pareve "Cream" of Zucchini Soup. The Brown Sugar Salmon is oh-so do-able with the Teriyaki Sauce Substitute in the 3Day Guide. I get stopped in the streets of Jerusalem by women who tell me the Good as Gold Potatoes, Forgotten Zucchini, Caramelized Chicken and Best Meatballs (use potato flakes instead of breadcrumbs) are Shabbos favorites. Marsala Carrots, and Sephardic Leek Patties appear every Pesach in our house. The winner of this lovely, inspiring book (as I've been told!) with go-to recipes for Rosh Hashanah— Pesach and Shabbat, too.....is Terri Saraj...@....com, from the US. Mazal tov! Get your entry in for the next drawing, one per week until Passover, when you request your 3-Day Guide. It's free and will help you, get organized and happy so that you will arrive at your seder with a smile— and your crown— intact.